What better way to beat boredom than by making your own toys or decorations? 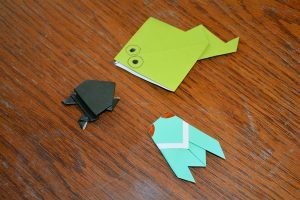 In this workshop, Crystal and you will work together as she gives you step-by-step instructions for making various origami animal creations. Some projects may be simples ones, needing only five steps; others may be more complicated, necessitating as many as 17 steps. You’ll come away knowing how to make tadpoles, frogs, butterflies, foxes, birds, fish, and insects. Material fee: $3 per participant.